I hate quitting books. I like to tell myself “if I can just get through a few more chapters, I will all of the sudden love it!” A librarian friend of mine recently told me “why do that to yourself? Life is too short to read bad books. Plus you aren’t hurting its feelings.” Today I am taking her advice before reading one more God awful chapter in the book “White Girl Problems.” Remember the awkward story about how I purchased the book? Turns out it was all for nothing. Below is the review I just posted on my Goodreads account. I felt the need to post it here in case any of you were thinking about giving it a whirl. What a disappointing book. 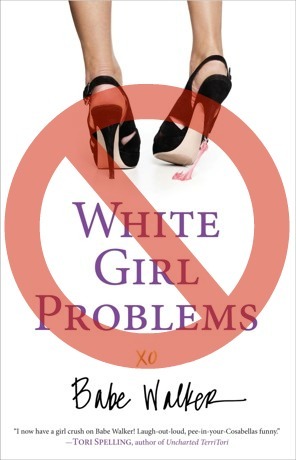 I know, I shouldn’t have expected TOO MUCH with a title like “White Girl Problems” but not only was this book unfunny, it actually made me angry! White Girl Problems is labeled as a memoir, however 20 pages in I thought “there is no way this is true.” Come to find out, it is not a memoir at all. The book was written by two men and their gal pal. The “author” Babe Walker is not a real person. The actual writing itself is extremely annoying and shallow. Part of the fun in reading memoirs (even made up memoirs) is finding areas in which you can relate to the author. Even if you cannot relate to the exact situation the author is describing, you can normally relate to the feelings that are produced because of the situation. With White Girl Problems, I just became disgusted and thanked God that I couldn’t relate to any of it. This is not a book about “white girl problems” (whatever those may be), it is a book about a spoiled, self-absorbed, materialistic, socialite. Even knowing that, the stories are nowhere near believable. And this is coming from someone whose imagination is in overdrive most days! Clearly some people have found humor in this book, but in good conscience I cannot recommend this book to anybody. Instead, read a memoir that is actually a memoir, written by a real author! Im glad you’ve made this post, I was just about to purchase it! Shame that this book was just all a sham. Oh I’m so glad you didn’t! Granted, there are tons of people that loved it and gave it 5 stars on Goodreads, but I have a strong feeling you would dislike it! I bet you can find samples of the book online for free, then you can see if it is something you would want to purchase! Wow I hate hearing things like that! I’m so sorry the book sucked so bad!